So, you like the overall feel and sound of a ukulele, but need a bit more? Why not get an electric ukulele? Chances are that many of you didn’t even know that they existed, due to just a few acoustic electric ukulele reviews on the internet. That’s exactly why we are going to cover the basics when it comes to ukes, see the best electric ukulele options out there, as well as the electric ukulele reviews we’ve written after testing them out. Whether you’re looking for the best acoustic electric ukulele, or just want to learn about this small yet amazing instrument, let’s get started! Before we dive into the world of the best electric ukulele brands and models on the market, you should first get to know the instrument. You may ask, “What is the best electric ukulele to buy?”. In order to understand the specs and features of different options, you need to know exactly what you are looking for. Unlike guitars, which, though there are a couple of different sizes, are pretty much standardized, ukes come in 4 different sizes. The soprano type is the oldest type of ukulele. It is the smallest member of the family, with the overall length of around 21 inches. Due to its compact and lightweight design, it is perfect for smaller musicians and kids looking to take up music. It’s definitely the go-to option for anyone looking for an instrument to take with on trips with their friends. As it is considerably smaller than the other types, the 13-inch scale may seem as too small for anyone transitioning from an acoustic guitar, but after some time of getting used to it, it’s very fun and easy to play. The sound also differs and can be described as bright. 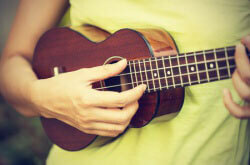 When you think of a ukulele sound, you’re thinking of a soprano. Next, we have the concert type. It is a bit larger than the previously mentioned soprano and definitely offers a different feel. Concert ukes usually boast a 23-inch body and a 15-inch scale. While this may not seem like a huge difference, it gives this type a couple of advantages. With a slightly larger scale, you will be able to adapt more quickly and easily. Though it is not as compact as the soprano, the concert uke is small enough to carry around. As far as the sound goes, a larger resonance box makes for a richer low end and higher volume levels. 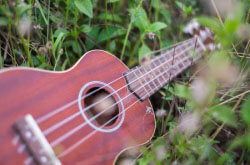 It still has that authentic ukulele sound, but with a smooth bass flavor and stronger overall presence. The tenor type has an overall length of around 26 inches and a 17-inch scale. If you have any experience at playing an acoustic guitar, you shouldn’t have any problems handling this instrument. Having more space to maneuver your fingers around makes it very comfortable and easy to play, especially if you have slightly larger hands. As expected, a larger body gives you the ability to produce a very resonant and deep sound. Though straying a bit from the classic bright sound of the soprano, the tenor ukulele type is an interesting instrument to experiment with. And finally, the biggest of the bunch, the baritone. With a huge body (at least in the world of ukes) at around 30 inches in length, the baritone offers a unique musical experience. A 19-inch scale almost feels like you’re playing the guitar, but with a nice twist to the sound. As the tuning of a baritone ukulele is the same as of a guitar (the four highest string of a guitar), you can simply pick one up and start playing in no time. Offering a very deep yet warm sound, the baritone couples nicely with other uke types, as well as acoustic guitars and similar instruments. While you could tune your ukulele in almost any manner you may come up with, there are certain standards that are important for you to know. Soprano, Concert, and Tenor ukes are usually tuned like this: G C E A. Baritone ukes, on the other hand, have a different tuning: D G B E, like the four highest strings on a guitar. 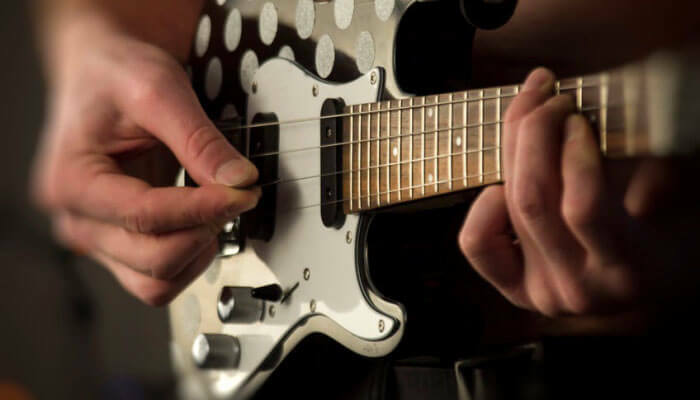 A popular alternative tuning is A D F# B, is often used on soprano and concert ukes, as it gives them an extra mellow sound while fretting chords is still fairly easy. It’s important to have these tunings in mind, as different string packs are made for different tunings. When it comes to build types, you can think of ukes simply as small guitars. Electric guitars come in as hollow body or solid body. The same applies for electric ukes. While some people refer to them as electric ukes, there is one important thing to note. Acoustic-Electric ukuleles are built more like a standard, acoustic ukuleles, but have a built-in pickup and some electronics so they could be plugged into an amp. Electric ukuleles look like a small version of an electric guitar. They have a solid body and pickups that are on the outside. While these two terms may be confusing at first, it’s important to know what you’re looking for. But what’s the difference between a hollow and solid body uke? 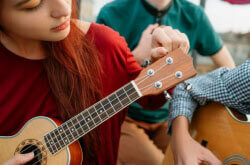 Hollow body ukuleles will perform and sound just like a regular, acoustic uke. You can play these with, or without an amp, and it will still sound awesome. Solid body ukuleles, on the other hand, need an amp to deliver sound. While they are more solid and sturdy than hollow body ones, you can’t just pick one up and play it without an amp. The sound also differs, because the wood is solid, and doesn’t resonate as good as a hollow body. They are mostly used when played alongside a band, as they can usually deliver more volume and gain. At the end of the day, it’s up to you. Do you want a more versatile but fragile instrument, or one that you need additional gear for, but can take a punch? The materials which are used in manufacturing a ukulele have a huge impact on various components of its performance. Both the body and the fretboard should feel nice to the touch. While different finishes can alter the feel of the wood, you can still notice a difference. Next, the whole instrument should feel solid and sturdy. It’s hard to balance good sound and durability. And finally, but probably most importantly, the sound. While solid body instruments don’t depend on the tonewood choice as much as hollow body ones do, tonewood is called like that because it greatly affects the sound and tone. Mahogany – Due to different varieties of this wood type used around the world, mahogany can contribute to various types of sound. Generally speaking, it’s best described as sounding warm and slightly darker than other types. Cedar – If you want more of that low end, cedar is the way to go. Though it is considered as a softer type of tonewood, it is still pretty durable. The sound it provides is very sweet, round, and mellow, perfect for tenor and baritone ukes as well as the smaller of the bunch. Spruce – While it is generally used for guitar tops, spruce is a great option for ukes as well. Unlike cedar, spruce makes the higher end of the range stand out quite nicely. It complements the bright sound of soprano ukuleles but can turn out as an interesting choice for baritone ukes as well. Redwood – Sound- wise, redwood lands somewhere in the middle, between spruce and cedar. Clarity combined with a warm low end can give your instrument a very versatile and interesting sound. However, redwood is scarce nowadays, so it can be pretty expensive. Koa – As a tropical wood native to Hawaii, it’s the most popular choice for authentic Hawaiian ukuleles. The sound is very well balanced and resonates with the old-school uke vibe. Besides the wood types we’ve mentioned so far, there are many other choices out there. The most important thing to have in mind when choosing tonewood is the sound you would like your uke to have. If you’re still not sure, there are loads of videos on the internet showing the difference between various tonewood choices that can come in handy. Generally speaking, the more money you invest in an instrument, the better the overall experience, both build quality and sound- wise. However, there are loads of models out there with ridiculously high price tags. If you are a beginner, it’s more than okay to get a relatively cheap electric ukulele. As a more advanced musician, you probably have at least a rough idea of what you’re looking for. In the review section of this article, you will find not only electric ukuleles from different uke brands but from different price ranges as well. Ask yourself, do you simply want to try out a new instrument, or do you really want to invest money and time in learning to play? If you decide on getting a solid body electric ukulele, have in mind that you will need an amp as well. Coming from the well-known Cordoba Guitars, the 20TM- CE Acoustic-Electric Tenor Ukulele features great looks and sound for a reasonable price. Showing that great looks and class shouldn’t be neglected, Cordoba Guitars included premium looking bridge inlays and a rosette. The bottom cutaway not only makes this uke look sleek but helps you with reaching those last frets as well. Unlike most other models out there, the 20TM- CE doesn’t feature an all-laminate design. While this may be a thing of preference to some, we found that it gives this ukulele a nice feel under the fingers. Tonewood of choice is mahogany, so besides good durability and overall build quality, you can expect it to have loads of richness and resonance. Sound- wise, the 20TM- CE was a very pleasant surprise. You can’t really expect much of an electric uke at this price range. Sustain is above average and holds clarity for quite some time. While volume and punch could be slightly better, you can always turn up the volume on your amp. The included pickup is high quality and conveys the vibrations accurately. However, if you’re looking for a uke that’s best for live performances and recording, this may not be the right one. While Cordoba Guitars may not be one of the best electric ukulele brands out there, their 20TM- CE definitely shows that they know their business. If you are a beginner looking for an affordable, well built and sweet-sounding uke, definitely consider getting this model. As probably the most popular ukulele manufacturer, Kala decided to make an electro-acoustic version of their best-selling model. The KA- CE offers great specs and features, at a price of only around $50 more than the acoustic model. Though at first glance it may seem as just another bland electric uke, the KA-CE has a few surprises up its sleeve. The top sports an old-school white binding, and the satin finish gives it a traditional, sleek look. All of the small design details show that Kala pays attention to every part of their instruments. The Shadow Active Nano-Flex EQ system is very lightweight. Unlike the previous model we’ve mentioned, you can hardly notice that this is an electric and not just acoustic uke. You have an easy access to volume, bass, and treble controls. Kala even included a built-in tuner, for extra convenience. While the pickup itself does perform nicely, there are definitely better ones on the market. Anything more than jamming with your friends or doing small venue gigs and you will need a more powerful pickup. All things considered, the KA-CE by Kala may not be the best electric concert ukulele out there, but for the under $150 price, it’s a great option for any beginner looking for a solid electric uke. A Les Paul uke? That’s right! While Epiphone may not be famous for their ukulele line, the little Les Paul is an interesting model to consider. First of all, we have to mention the price. The Les Paul uke goes for just over $100, and with that being said, it wouldn’t be fair to compare it to the other, more expensive models. The design is downright awesome. Whether you choose the vintage sunburst or cherry burst finish, you are definitely going to stand out. While the glossy laminated finish looks good, the overall build quality could definitely be better. It’s not bad to the point that it affects the sound too much, but we’ve seen slightly more expensive ukuleles with a noticeably better feel. The folks at Epiphone decided to go with a passive system with this one. Though you don’t have any onboard controls to fiddle around with, you also don’t have to worry about the battery, because it doesn’t need one. That also means that this uke is very lightweight and easy to carry around. When played without an amp, it sounds pretty sweet and warm. Plug it in, and the highs really cut through nicely. Again, there are definitely better-sounding models on the market, but at this price range, it’s as good as it gets. Whether you just want a different looking ukulele or dig the Les Paul design, the Epiphone Les Paul Acoustic-Electric uke is one of the best electric concert ukulele options for around $100. The Vorson FTLUK3BK is a solid body electric tenor ukulele that rocks that familiar Telecaster design. But how does it perform, and is it worth the around $100 price tag? Continuing in the spirit of famous guitar-shaped ukes, this model is just a beast! According to most online reviews, it’s regarded as the best budget electro-acoustic tenor ukulele when it comes to solid body models. The wood choice being candlenut means that this puppy feels solid yet lightweight. As we’ve previously discussed, solid body ukes are a great choice for anyone wanting to implement the sound of this sweet instrument into their band. So, if you plan on having this uke hanging around your shoulders at gigs, you won’t have to worry, as it is very lightweight. The dual single coil setup allows you to deliver the full potential of your playing skill. It can go all the way from sweet, mellow, and cheerful, to pretty heavy- sounding, depending on the setting you adjust on the amp. Just like on a regular guitar, this model features a volume and tone knob, as well as a 3-way switch for the pickups. So, if you are looking for a badass looking uke to implement in your band, look no further than the Vorson FTLUK3BK! In terms of aesthetics, the Kmise Solid Spruce ukulele will definitely catch some attention. However, is it all about design, or does it sound just as good as it looks? Featuring a solid spruce body, you can rest assured that this uke will definitely last you a long time. Even though Kmise isn’t that well known in the world of ukuleles, they seem to know how to make a solid and sturdy instrument. If you are looking for great resonance and sustain, you will be pleasantly surprised by this model. The spruce body combined with a bone nut and saddle results in a very bright and present sound. On the top, you will find bass, middle, and treble controls alongside a volume knob. It even features a small tuner as well, making it perfect for simple plug & play occasions. It was amazing how soft and smooth this uke felt while being played. No sharp edges or unpolished surfaces, making it great even for longer playing sessions. Even the stock strings felt good enough in comparison with the other models. You probably won’t have to change them anytime soon. Though it is a small detail, it definitely rounds this model up as very fun and comfortable to play. It seems that price doesn’t always dictate quality. For just over $50, the Kmise Solid Spruce Ukulele is a wonderful instrument for both beginners and more advanced players. Not only does the Oscar Schmidt concert uke sound and feel premium, but it comes with all of the necessary equipment you need to start playing right away! The acoustic version of this model turned out to be one of the best ones on the market when it comes to entry level ukes. With a lot to expect from its electric-acoustic sibling, let’s see exactly what the OU2E is all about. Out of the box, it’s obvious that this might be the best electric ukulele for beginners. For around $100, you really can’t expect much. However, the OU2E turned out to be quite a surprise. Quality-wise, there is a clear difference between this model and most other budget ones. The mahogany body boasts a very precise and soft finish and feels very sturdy and comfortable. The sound is pretty warm, yet feels well balanced. 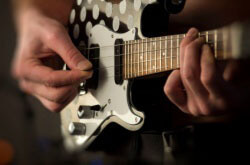 Though there is some buzzing noise when you strum a bit harder, it’s not that of a big deal. Both the pickup and preamp performance are on point. Maybe not that great for playing alongside a band, but certainly good enough for solo performances and casual jamming. What makes this bundle so great, besides the uke itself, are the included accessories. Included in it, are an instructional DVD, a clip-on tuner, as well as a polishing cloth. Besides an amp, you’ve got everything you need. At the end of the day, you can always plug it in a regular guitar amp, and rock on! All things said, the Oscar Schmidt OU2E ukulele bundle is a great starting point for any ukulele beginner, as well as a well-rounded gift. Just when you thought all of your needs have been covered by the previous bundle, the Ellen Concert Ukulele bundle shows up. For a similar price (just under $100), you’ll be getting not just a very playable yet cheap electric ukulele, but an amp, bag, and some useful pieces of gear as well. This concert uke feels surprisingly solid. While the previously mentioned OU2E model by Oscar Schmidt definitely has a better feel to it, it doesn’t necessarily mean that this one isn’t a good choice. It’s obvious that some corners had to be cut in order to include an amp and all the other accessories at an affordable price point of under $100, but as far as we’ve seen, it’s all about aesthetics and details. Though this one is definitely a good acoustic electric ukulele, the overall design and finish could use some improvements. However, what’s most important, is that it doesn’t really affect the sound that much. Sound-wise, you can definitely tell that it’s a budget instrument. On the other hand, having in mind that you really don’t need anything more to immediately start playing, it sounds more than decent! You will experience the authentic and rich ukulele sound, especially when you use it with the provided amp. It gets really loud considering the small size of the amp itself. Boasting a classic mahogany body, it vibrates with a dark yet balanced sound. It even has a built-in 3-band EQ, as well as an LCD screen tuner for extra convenience. So, if you plan on taking your uke on the streets to make a dime or two, this bundle is perfect! No ukulele review would be complete without mentioning at least one model from the famous Luna, as they are regarded as one of the best (electric) ukulele brands on the market. Their Mahogany Series Tattoo concert acoustic-electric ukulele is all about quality. More advanced ukulele players will definitely value the amount of detail that has been put in making this instrument, and the beginners can use it as a guideline as well. So far we have covered great budget and bundle options, but this Luna ukulele offers premium quality at a more than reasonable price point. Starting with the design, you can tell this is a Luna uke at first glance. With the “tattoo” pattern on the body, the artist tried to depict the waves and the true essence of Hawaii. All of the parts were carefully put together in order to provide the musician with a smooth and enjoyable playing experience. You can definitely say that this is one of the most comfortable ukes out there, both in terms of handling and actually playing. While the electronics don’t offer an LCD tuner unlike some of the other mentioned models, there is a 3-Band EQ. It’s very precise and allows you to shape the sound just the way you want to. No matter how you set up the EQ, it just sounds amazing. The mahogany body gives it additional resonance and sustain. If you are looking for a uke with a design that matches the sound, resulting in an authentic Hawaiian flavor, you can’t go wrong with this one. If you don’t mind getting “just” a ukulele for under $150, you should definitely go for the Luna Mahogany Series Tattoo concert uke. You’ve probably figured by now that, while there aren’t that many choices when it comes to electric ukes (unlike other instruments), the models we’ve present offer different approaches and designs. In order to find the right electric ukulele for your needs, think about what you actually want. A great sounding uke for a bit more money? Or a simple bundle that will do the job? Or something in between? Whatever the case may be, we hope that you found this article helpful, and maybe even found the right one!